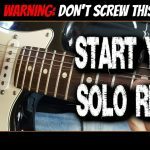 In this Santana licks lesson you learn how to play 3 awesome Carlos Santana licks step-by-step as heard in Black Magic Woman., This is one of Santana’s most famous recordings and showcases the Santana guitar style perfectly! Black Magic Woman is essentially a minor blues in the key of D minor and all three of these Carlos Santana licks are using the D minor pentatonic and blues scale patterns up around the 10th fret. To get that Carlos Santana guitar tone use the neck pickup on your guitar with a small amount of distortion. Backing off the tone control on your guitar a touch will also help make these Santana licks sound authentic. 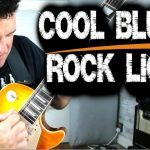 Let’s get started with the Santana quick licks lesson! Carlos Santana Lick #1 – this is the lick Santana uses to kick off his intro solo on Black Magic Woman. Carlos Santana Lick #2 – This lick shows you how Carlos ends the intro solo on Black Magic Woman. Carlos Santana Lick #3 – Carlos uses this lick in one of the later Black Magic Woman solos. Notice his cool phrasing and use of rhythm at the end of the lick!